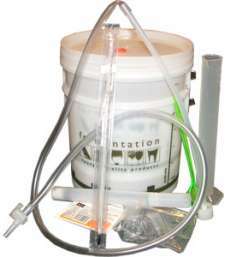 Home Wine Making Equipment - Home Brewing, Wines & Beers etc. You will need to get some wine making equipment, don’t forget to check out the second hand market first, but it’s not too expensive to get started. You can buy starter kits for as little as £25.00 that will provide all you need apart from things that you will have in the kitchen anyway. Do check exactly what is included and compare with buying the parts separately. A large saucepan is useful when making wines from natural ingredients, if you have a preserving pan for jam making, that will be fine. Best to avoid aluminium or copper though, stainless steel is best. Demijohns, we use those one gallon large glass bottles, fitted with a bored rubber bung into which the airlock fits. Nowadays you can buy 5ltr plastic versions already fitted with a grommet for the fermentation air lock. The airlock allows excess carbon dioxide produced by the yeast to escape but stops air loaded with wild yeasts etc getting back in. A measuring jug and kitchen scales, which you should have anyway. A couple of large food grade plastic bins with lid for when you start making country wines. It is pretty important to get the right type of plastic. Other grades have microscopic holes that allow yeasts and microbes to hide and will probably result in spoilt vinegar. Plastic siphoning tube, usually you can buy this by the metre. You can also get a syphon pack which has a tap to control flow and a valve to help avoid sucking up sediment when racking. A hydrometer, this is a device used to measure the specific density of the liquid. Technically, it compares the weight of the liquid to that of water. By measuring the density when you start and finish you can calculate the amount of alcohol in the final wine. Sugar is heavier than water where as alcohol is lighter. You can buy high-tech digital versions or a manual type for a couple of pounds that will last for decades. Bottles – start saving every wine bottle you can and ask your friends and relatives! Wash them out thoroughly as soon as possible to stop mould growth and them getting smelly. Corks can be bought for just a few pence each and plastic covers that shrink fit when heated (we use a hair dryer) to cover the end. Never re-use corks, no matter how you try to sterilise them, used corks will spoil your wine. Corking machines can be bought from just a couple of pounds up to sixty pounds. We found the twin-lever type for around ten pounds far better than the cheapest ones.